At The Y Life we are celebrating our Summer with you, by introducing our favorite trending cocktail of choice… Rosé! The name says it all… Rosé… Not White, Not Red… But more like a perfectly Pink hue! In fact, the reasoning behind the color is simple, a much shorter maceration period than other grapes, causes this wine to turn Rosé. Unlike Red wines, which have quite lengthy aging processes- the shorter two to three days of maceration are what end up giving Rosé its unique, distinguishable and refreshing flare that pair perfectly with Summer munching favorites like fresh berries and seafood. So where does Rosé come from? Chateau d’Esclans is located on elevated land near the Gorges de Pennafort, Northwest of the City of Frejus on the Mediterranean coast. The Chateau’s cellar structure, which is known today as the oldest in the region, dates back to before the 12th Century and was inspired by Tuscan Villa design. As it sits today the Chateau was built during the mid 19th Century. Château d’Esclans is perfectly centered in the Department of the Var, where the majority of Provence AOC Rosé is produced. In 2006 Sacha Lichine acquired Château d’Esclans, and today there are 108 acres of vineyards. The primary grape grown on the property is Grenache followed by Vermentino grapes; the Château is known for its old Grenache vines, which produce grapes that offer greater concentration of flavor than do the younger vines. Grapes and wines from Château d’Esclans, come together with local growers in the region to create what has become the world’s greatest Rosé! The Whispering Angel chapel from early 19th Century, with its two cherubs inspired the creation of Whispering Angel. 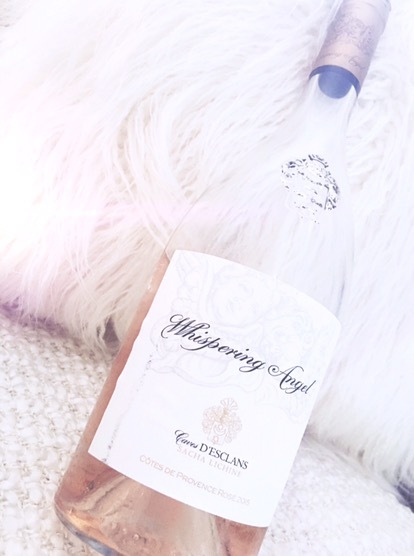 The light, clean and flavorful notes you will sense in Whispering Angel are in essence the part, which makes this Rosé flawless. You can start sipping on Whispering Angel from mid-day and continue on sipping into midnight, because its smooth texture whisks you away to another place and time, as if you were lounging on a yacht on the Côte d’Azur just sipping the day away. The fact is there has been a stark increase in sales of Rosé over the past decade and the noise around town from experts, wine connoisseurs and celebrities alike is that Rosé is the one and only option for Summer sipping… And not just any Rosé, but Whispering Angel. Having launching Whispering Angel 10 years ago, the winemaker Lichine, who just happens to now be based in Miami, had us wondering if… we should place sipping a glass of Whispering Angel with Sacha himself a Millennial Bucket List To Do for 2016? I think YES! You? W.A. has become the chicest of cocktails since and it’s a summertime staple amongst famed Hollywood socialites and for $22 bucks a bottle, who wouldn’t want to snag some up Rosé and feel like a Star, right? I had to know what all the rage was about when I saw SJP and the Beckham’s Gramming about their favorite Rosé, so I went to Whole Foods and picked up a bottle… Now, I know exactly Y anyone would want to sip on this wine. It’s Ah- May-ZING! Commonly referred to as the “Hampton’s Water” — I can see Y this delicate, feminine and genuinely light wine is a beverage of choice. It’s a little sweet and yet perfectly balanced, it was so light, I almost forgot I was actually drinking alcohol— honestly, it was exactly what I wanted the “perfect” Rosé to be. It wasn’t hype surrounding the wine— gosh darn it, it was just TRUE! I guess if you tried to conjure up what angels would be whispering about as they were sipping on a heavenly spirit, this would be it! AND… it seems to be striking up quite a chord with Millennials. Rosé is different from the traditional Red and White wine, just as Millennials are different from the old and new generations, and we are embracing this swanky cocktail as our wine of choice. This affination for Rosé is sometimes referred to as being derived from our ‘Millennial Foodie Culture’ by some experts— and although the Rosé ‘Season’ is officially from Memorial Day through Labor Day, Millennials are mixing that whole tradition up to— because we really don’t care! Y’s agree with you, leave the ‘Seasoning’ to the reckoning and drinking what you like, whenever you like it!